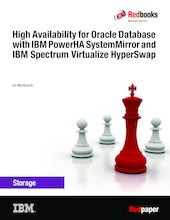 This IBM® Redpaper™ publication describes the use of the IBM Spectrum™ Virtualize HyperSwap® function to provide a high availability (HA) storage infrastructure for Oracle databases across metro distances, using the IBM SAN Volume Controller. The HyperSwap function is available on all IBM storage technologies that use IBM Spectrum Virtualize™ software, which include the IBM SAN Volume Controller, IBM Storwize® V5000, IBM Storwize V7000, IBM FlashSystem® V9000, and IBM Spectrum Virtualize as software. This paper focuses on the functional behavior of HyperSwap when subjected to various failure conditions and provides detailed timings and error recovery sequences that occur in response to these failure conditions. This paper does not provide the details necessary to implement the reference architectures (although some implementation detail is provided).